The six yards of beauty adorned by nearly every Indian woman is one of the simplest, yet most diverse types of attire. Just as the architecture, heritage, and literature from different parts of India can vastly differ from each other, the textile industry boasts similar variety. While the basics remain the same, the incredibly versatile saree has a plethora of weaves, embroideries, and embellishments. Let’s explore some of the most popular, culturally significant, and trendy types of sarees that every Indian woman needs in her closet! Paithan is a town in Maharashtra that produces what is widely acknowledged as one of the richest sarees in India – the Paithani saree. Made from very fine silk, this saree is characterised by borders of an oblique square design, with parrot, floral, geometric, and peacock patterns on the palo. The Paithani saree is usually available in bright shades of red, blue, yellow, green, and pink, with an influence of Buddhist paintings that are often evident in the motifs. Right from dyeing the yarn to weaving the zari, the creation of a Paithani saree is truly a work of art. The craftsmen from Paithan and Yeola that work on this handloom are specifically trained to make these sarees. The striking colours, creeping zari embroidery, and colourful floral patterns are what distinguish these sarees from others. Handloom sarees are among the most preserved crafts of traditional Indian artisans. The Bomkai saree from Odisha is one such type of saree. Also known as Sonepuri sarees, these are a blend of ikat and embroidery, interwoven on a pit loom and resulting in an extraordinary fabric. If simplicity is your style, then the Bomkai saree – with its tribal patterns on the palo and borders – is the one you should choose. Like many other types of sarees, these tend to have contrasting colours on the borders, but the colours generally have an earthy tone to them, giving them a more sober look. Although the Bomkai saree may not be in your face, it has a distinctive, stately look that will undoubtedly catch your eye. Kanjeevaram (or Kanchipuram) is a type of silk made in the Kanchipuram district of Tamil Nadu. Woven from pure mulberry silk thread, the classic Kanjeevaram saree is characterised by its use of bold and contrasting colours with grand zari work at the border and on the palo. This unique saree has a distinctive weaving technique because of which it is a whole three inches wider than other weaves, at 48 inches in width. The patterns and designs in Kanjeevaram sarees are inspired by images and scriptures in South Indian temples, paintings by Raja Ravi Varma, and the Mahabharata and Ramayana, or from nature in the form of leaves, birds, and animals. It’s these traditional patterns that give the Kanjeevaram saree an old-world look. Meanwhile, the impeccable quality of the silk makes it look regal and opulent, and so it’s the most popular South Indian weave. Northeast India is famous for its rich heritage and picturesque tea plantations. Muga silk sarees, from Assam, are nearly as popular all over India for their gorgeous golden tinted fabric and extreme durability. Having been around since the Ahom dynasty, the fabric is produced by the Garo community of Assam. The shine of the fabric is said to improve after each wash, making it a saree that will last you a lifetime. The golden-yellow base and geometric jappi, miri gos, and kabutar motifs are the defining features that set the Muga saree apart. Whether you plan to wear it as the Assamese traditional Mekhela Chadors outfit, or give it a modern spin by experimenting with the draping style, or even pair it with a collared blouse, you can’t possibly go wrong with Muga silk. If simplicity is your style, the Kota Doria saree from the city of Kota in Rajasthan is the way to go. Its delicate weave gives it an almost translucent appearance. As a contrast to more tradition ‘heavy’ sarees, the Kota Doria saree’s fine thread makes it lightweight, so it’s perfect for the arid Rajasthani climate. The defining feature of this saree is the chequered pattern, known as khats. Historically, the Kota Doria fabric was favoured by Rajasthani royalty because of the effortless grace and style it portrayed. If you think Kota Doria is for you, go for the basic, printed, and zari styles that are apt for any occasion. Varanasi, also known as Benaras, is where one of the finest India sarees derives its name from. The Banarasi saree is known for its rich gold and silver brocade and intricate embroidery. 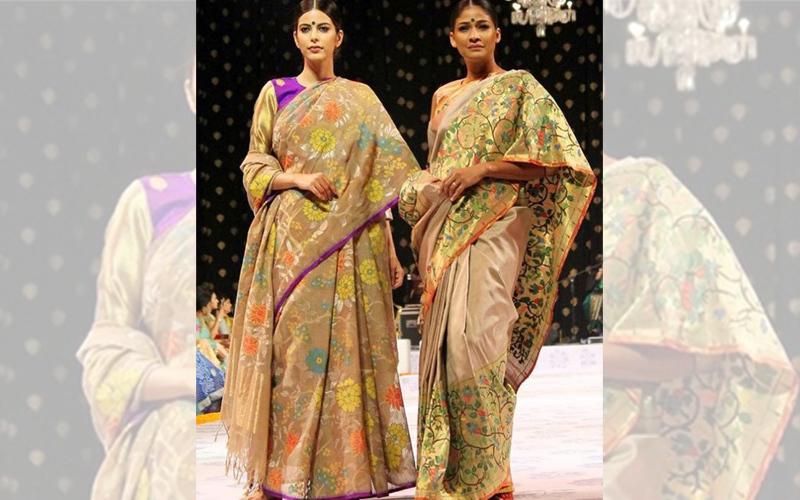 The designs on these sarees are inspired by Mughal patterns of intertwined floral and foliate motifs. Compact weaving, figures embroidered down to the smallest detail, metallic visuals, jal, and mina work are what make well-crafted Banaras saree stand out among others of its kind. 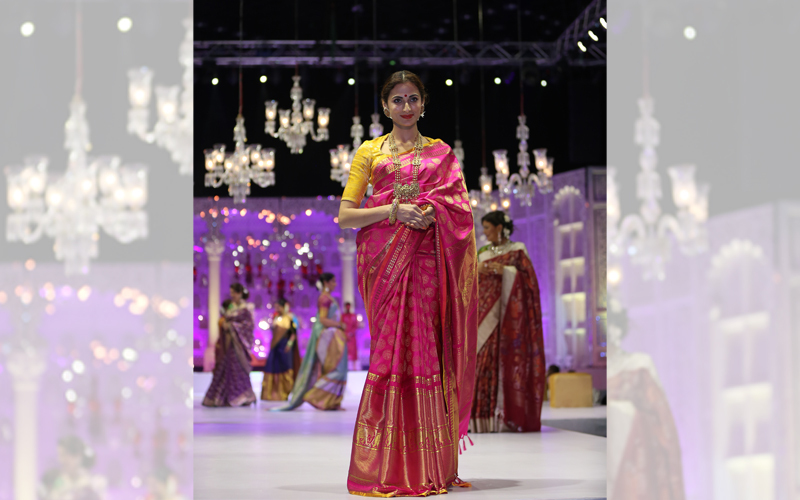 On her wedding day, many brides choose to don this saree, a testament to the opulence of the garment. If standing out and turning heads is your aim for the night, you can’t possibly go wrong with a Banarasi silk saree. The iconic cream Kasavu saree with its gold border is considered one of the most distinguished types of sarees. Originating from Kerala, the handloom saree traces itself back to the Buddhist era. Owing to its sophisticated appearance, the traditional Kasavu style has since managed to find its way onto other articles of clothing, including kurtas and skirts. The pure gold borders have gradually been replaced with a dash of colour in the zari, and the designs on this type of saree represent the cultural essence of Kerala. Also known as a Kerala tissue saree, the Kasavu saree is traditionally worn with a similar cream and gold blouse, though this has been changing recently. The fashion-forward now pair it with floral or geometric patterns in contrasting colours to add a modern touch to the attire. Woven in our own state of Telangana, in a district called Bhoodan Pochampally, the Pochampally saree is rather unique in its design and holds one of the top spots in every saree-lover’s heart. From its intricate and geometric designs to the double ikat style of weaving, the Pochampally saree is one of the state’s artisanal gems. The colours of the sarees are generally derived from the blend of natural resources while the fabric can be cotton, silk, or sico (a mixture of silk and cotton). If you’re finding it hard to recall where it is that you’ve seen this type of weave, it is likely that you spotted it on your last Air India flight, where the cabin crew wear specially designed Pochampally silk sarees as homage to its cultural significance. Almost every Indian woman is familiar with the characteristic dotted pattern of the Bandhani saree. The unique tie-dye textile is created by plucking the cloth with the fingernails into many tiny bindings, forming various patterns. Most Bandhani fabric is produced in Gujarat and dates back to the Indus Valley civilisation. Taken from the Hindi word, ‘bandhan’, meaning to tie up, this type of saree gained popularity over the years, and today you’ll most definitely find a Bandhani saree in every Indian woman’s wardrobe. This versatile saree can be heavily riddled with mirror-work and embroidery, making it grand, or can be worn more simply. The Phulkari saree is an embroidery technique from Punjab that has quite a self-explanatory name. Literally meaning ‘flower work’, the more heavily embroidered Phulkari garments are known as baghs, meaning ‘garden’. Phulkari sarees are most commonly embroidered using white or yellow silk floss on cotton or silk sarees. The art of Phulkari was originally a domestic one – not meant for commercial purposes. This allowed the art to be fully explored during its early days, and now we have it in all of its creative glory. The embroidery on a Phulkari saree typically starts at the centre and then spreads through its entirety, with the palo and borders receiving a heavier touch. Warm colours and those that mirror the flora and fauna in nature are mostly used as the base for a Phulkari saree. Geometric patterns are often incorporated into the embroidery, making it very easily recognisable. Chikankari is one of the most popular styles of embroidery in India. Believed to have been introduced by the Mughal emperor, Jahangir’s wife, Nur Jahan, it is native to Lucknow and is one of the most intricate styles of embroidery. Naturally, this unique embroidery was transferred from smaller articles of clothing to the beloved saree. The fine embroidery swirls and spreads over the entire saree in beautiful floral patterns. Often done with white thread on pastel backgrounds, the Chikankari saree has a very delicate and feminine feel to it. Sometimes the embroidery is done using a more colourful palette that has a more vibrant and fun femininity about it, too. This is one type of saree that every girl who’s ever dreamed of being a princess absolutely has to own!